Made with Aussies in mind, our range of compressors is sure to meet your every need, packing enough power to stand up to harsh environments, from stormy weather to blistering heat. The Australian outback can be unforgiving, meaning a reliable compressor to inflate your tyres or carry out essential maintenance is a must. But as a highly versatile piece of equipment, the uses of compressors are endless for any professional handyman, farmer, or anyone else who works in the great outdoors. Industrial compressors make DIY jobs that extra bit easier, whether you need a larger, heavy-duty model for your workshop or a lighter, more portable compressor when out on call, our selection has you covered. The Bullmax Industrial Portable Compressor -385 FAD is fully capable of handling tasks such as spray painting, controlling air-operated machinery, and blowing out rattle guns, radiators and air cleaners. It’s specially designed to operate without mains electricity, making it ideal when out in the field. For a smaller compressor designed for on-site workshop jobs, choose Bullmax’s 170 FAD option. It can handle your car’s tyres, bits of spray painting, operating a nail gun, and clearing away dust. Bullmax guarantees the quality of every compressor for sale, so you can rest assured that the equipment you purchase will be of a premium standard. For extra peace of mind, you’ll receive a complimentary 3 year warranty on the tank and a 12 month (or 500 hour) warranty on every motor and compressor. 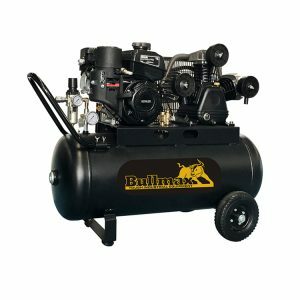 BULLMAX PORTABLE COMPRESSORS ARE DESIGNED IN AUSTRALIA FOR BOTH PROFESSIONAL AND DOMESTIC USE FROM SMALL SPRAY PAINTING JOBS TO OPERATING MACHINERY IN A SHEARING SHED. 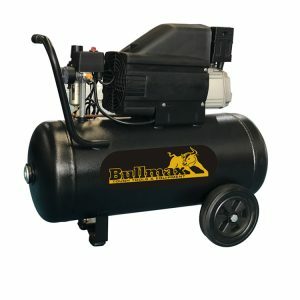 BULLMAX PORTABLE COMPRESSOR, DESIGNED IN AUSTRALIA FOR PROFESSIONAL AND HEAVY DUTY USE UNDER AUSTRALIAN CONDITIONS, LIGHT WEIGHT AND EASILY TRANSPORTABLE, THIS VERY HANDY MACHINE IS AN IDEAL WORKSHOP COMPANION FOR INFLATING TYRES, SMALL SPRAY PAINT JOBS TO DUSTING DOWN PARTS OR OUT ON SITE HOOKED UP TO A NAIL GUN, RIVOT GUN, STAPLER. PACKED FULL OF FEATURES NORMALLY ONLY AVAILABLE ON MUCH LARGER MACHINES. DESIGNED IN AUSTRALIA FOR PROFESSIONAL AND HEAVY DUTY USE UNDER AUSTRALIAN CONDITIONS. POWERED BY A USA KOHLER 5.5HP COMMERCIAL QUALITY ENGINE, IDEALLY SUITED FOR USE WHERE MAINS POWER IS NOT AVAILABLE. DESIGNED WITH A STRONG FRAME AND SOLID WHEELS, IS EASILY TRANSPORTABLE. DELIVERING 365 LITRES/MINUTE FAD, IS SUITABLE TO OPERATE MODERN AIR OPERATED MACHINERY SUCH AS SHEEP HANDLING EQUIPMENT, SPRAY PAINTING, BLOWING OUT AIR CLEANERS AND RADIATORS, RATTLE GUNS OR ALMOST ANY AIR TOOL. CONVENIENT, VERSATILE COMPRESSED AIR WHENEVER YOU NEED IT, WITHOUT THE NEED OF MAINS POWER OR A GENERATOR. 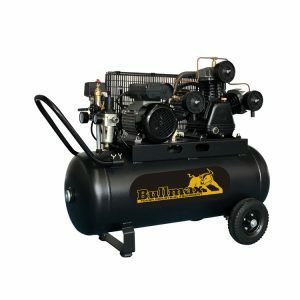 BULLMAX PORTABLE COMPRESSORS ARE DESIGNED IN AUSTRALIA FOR BOTH PROFESSIONAL AND DOMESTIC USE FROM SMALL SPRAY PAINTING JOBS TO OPERATING MACHINERY IN A SHEARING SHED. THE BULLMAXPETROL COMPRESSOR IS POWERED BY A USA KOHLER ENGINE. 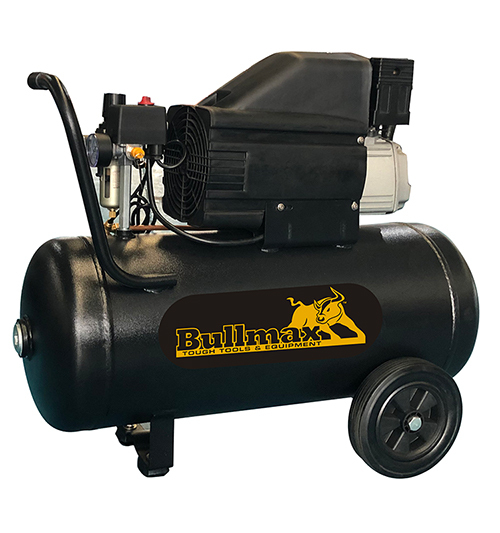 BULLMAX PORTABLE COMPRESSOR, DESIGNED IN AUSTRALIA FOR PROFESSIONAL AND HEAVY DUTY USE UNDER AUSTRALIAN CONDITIONS. POWERED BY A USA KOHLER 5.5HP COMMERCIAL QUALITY ENGINE, IDEALY SUITED FOR USE WHERE MAINS POWER IS NOT AVAILBLE, DESIGNED WITH A STRONG FRAME AND SOLID WHEELS, IS EASILY TRANSPORTABLE, DELIVERING 385 LITRES/MINUTE FAD, IS SUITABLE TO OPERATE MODERN AIR OPERATED MACHINERY SUCH AS SHEEP HANDLING EQUIPMENT, SPRAY PAINTING, BLOWING OUT AIRCLEANERS AND RADIATORS, RATTLE GUNS OR ALMOST ANY AIR TOOL. CONVENIENT, VERSATILE COMPRESSED AIR WHEREVER YOU NEED IT, WITHOUT THE NEED OF MAINS POWER OR A GENERATOR. THIS IS A HIGHLY SPECCED MACHINE PACKED FULL OF FEATURES.